After spending much of the past year away from his family, you’d be forgiven for thinking that David Beckham would want to be at home as much as possible now. But it doesn’t look as if he will be, as he’s got yet another venture – he’s buying a London pub with his friend Guy Ritchie, and the pair plan to turn it into one of the capital’s drinking hotspots. 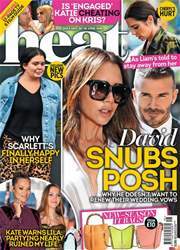 But, unsurprisingly, his ambitions have not gone down well with wife Victoria, who is frustrated that the project will take David away from her once more.